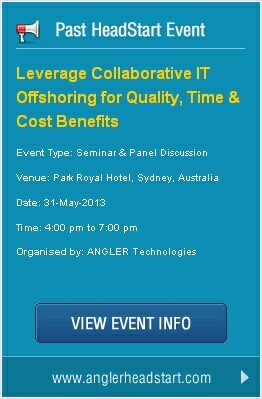 A big thanks to all who attended our ANGLER HeadStart event on the 31st May 2013 at Park Royal Hotel, Sydney and contributing to its success. Thank you for the interest you have shown in our Offshore Outsourcing Services, E-Business Products, Design Solutions and Online Marketing Services. We believe that the perspectives offered by us and the seminar & interactive discussion on “Leverage Collaborative IT Offshoring for Quality, Time & Cost Benefits” amply highlighted the importance of Offshore Outsourcing to your business success. We are keen to partner with you on a long-term basis, to provide a quality-oriented and cost-effective Offshore Development Services for your outsourcing requirements. Visit www.anglerheadstart.com for more info. Please send us your Offshore Outsourcing requirements using the form below.